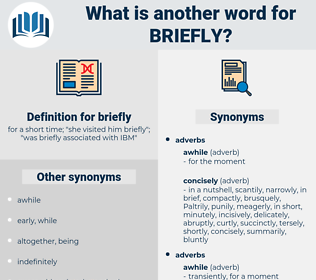 What is another word for briefly? for a short time; " she visited him briefly"; " was briefly associated with IBM"
concisely, shortly, summarily, soon, rapidly, swiftly, momentarily, promptly, speedily, expeditiously, simply, recently, slightly, immediately, just, broadly, urgently, essentially, readily, early, basically. long-windedly, permanently, verbosely, at length. We met last night, briefly, but to the point, or at least you and my uncle did. Let us briefly describe this subject.